Quogue, NY—Peconic Baykeeper (PBK), the only Long Island-based non-profit dedicated solely to the protection and improvement of water quality on the East End, is embarking on a mission of having towns adopt a “Net Nitrogen Reduction Policy” to clean up our waters. What PBK is asking town governments to do is simple: Take out more nitrogen pollution than you allow to be put into our waters. PBK is the only organization advocating for this approach. Nitrogen pollution has been an ongoing problem in our surface waters over the past few years, resulting in toxic algae blooms, brown tides, fish kills, and declines in shellfish populations. Septic systems are, by far, the largest cause of nitrogen pollution in our waterways, with development dramatically outpacing our ability to treat the wastewater we produce. While local, county, and state municipalities have begun taking steps to lessen nitrogen pollution inputs, none have agreed to adopt policies that would reduce the pollution actually reaching our fragile waters. For example, Suffolk County currently provides subsidies to homeowners who are interested in upgrading their septic systems on a voluntary basis, but not enough to offset the number of new septic systems being approved every year. Net Nitrogen Reduction is basic arithmetic: Municipalities should adopt standards that lead to a quantifiable nitrogen reduction on a yearly basis. If X new nutrient load is permitted in the municipality, at least X+1 load must be reduced in the municipality within the same year. For example, if the installation of 100 new septic systems, each producing 10kg of nitrogen each year, is approved in a municipality, the municipality must find a way to reduce its total yearly nitrogen output by at least 1,001 kg. In order to achieve net reduction, rebate programs should be paired with mandates requiring the installation of alternative septic systems in all new development. Community Preservation Fund (CPF) Water Quality Improvement Projects funds are available to support the rebate program. 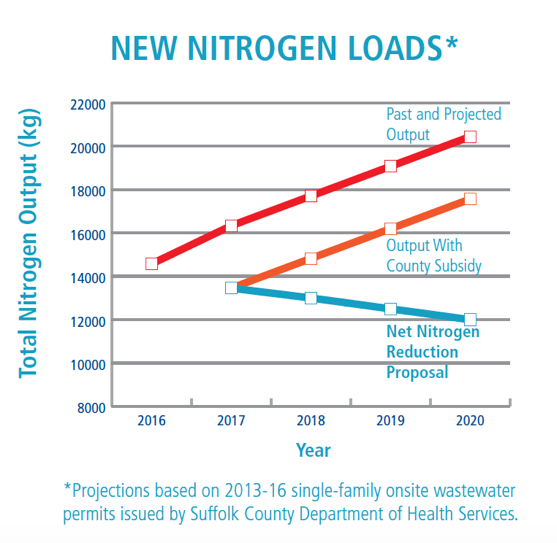 For more information about PBK’s Net Nitrogen Reduction policy, please contact the Peconic Baykeeper office at (631) 653-4804. Sean O’Neill will be available for interviews after August 7. Peconic Baykeeper is a 501 (c)(3) not-for-profit organization dedicated to protecting and restoring Long Island’s drinkable, swimmable, and fishable waters. Established in 1998 as Long Island’s clean water advocate, Peconic Baykeeper uses science, education, and law to defend the critical watersheds from the Peconic Estuary through the South Shore Bays. Peconic Baykeeper is a proud member of the international Waterkeeper movement, working actively with civic grounds, baymen, businesses, children, and the community at large to protect and restore water quality and Long Island’s watersheds.